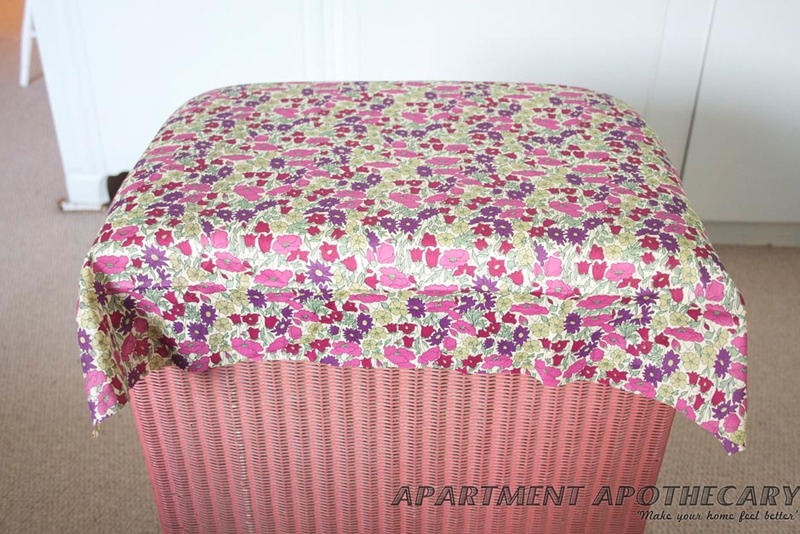 I have an original Lloyd Loom laundry basket that used to be my grandmothers and some beautiful Liberty of London ‘Poppy and Daisy’ fabric (I really can’t get enough, I think it’s becoming an addiction). 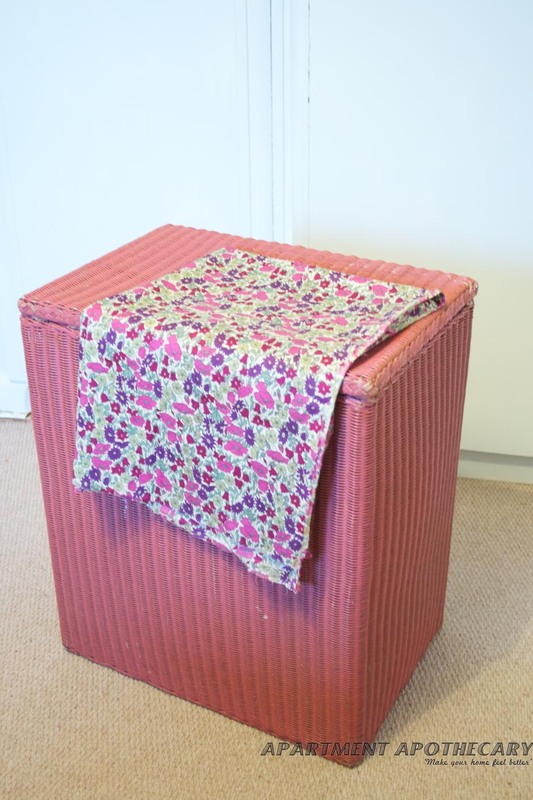 My grandmother covered the lid of the basket in beautiful Sanderson ‘Chelsea’ fabric, probably about fifty years ago. Needless to say it began to look more shabby than chic. So I decided to rejuvenate it so that it can also be used as a seat. 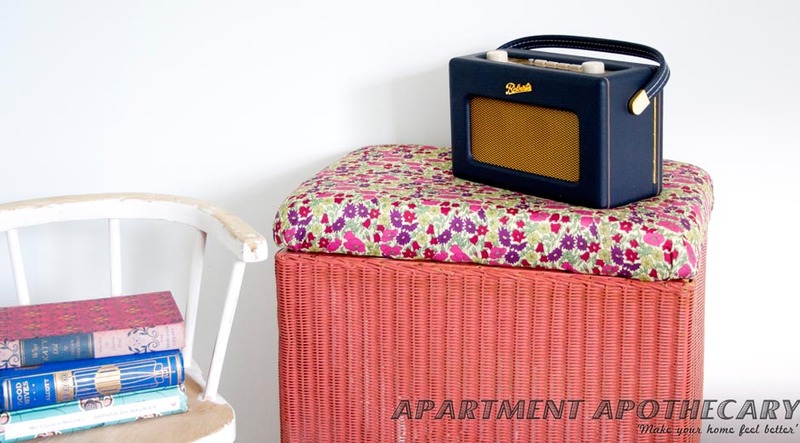 The beauty of this tutorial is that there are so many possibilities as you can tailor it to your exact needs: Change the colour of the basket using paint, use any fabric of your choice, use a different piece of furniture like a toy chest. 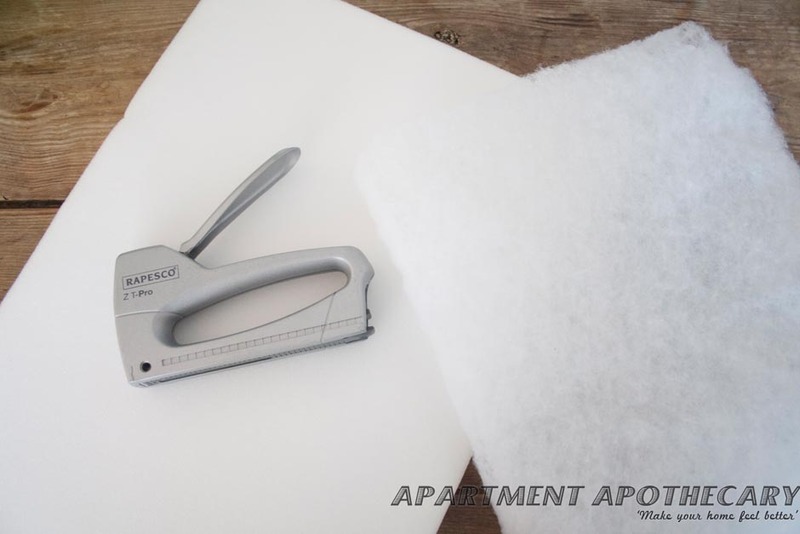 You will need: Staple gun, foam, dacron. 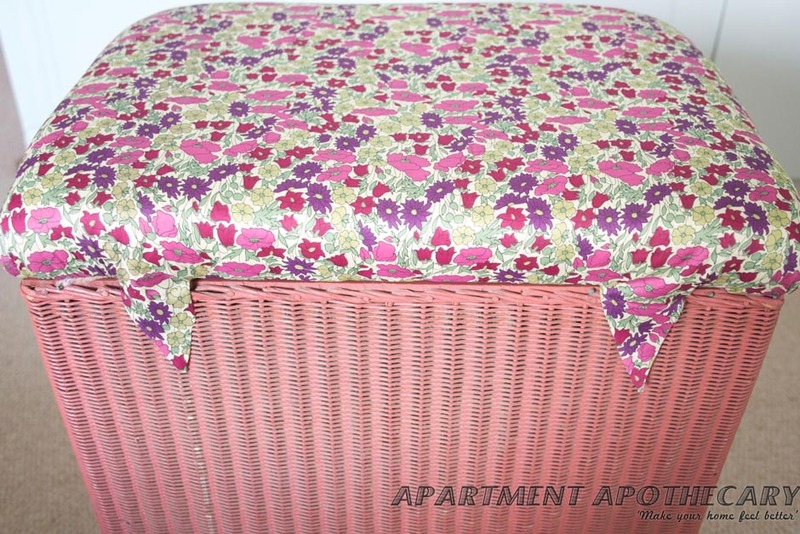 You will need: Lloyd Loom basket and fabric. I’m using Liberty Tana Lawn Poppy and Daisy cotton. 1. Place the foam on top of the basket. 2. Place the dacron over it. Make sure you have enough so that it can be pulled over the underside of the lid and stapled. 3. If there is someone to help you for this stage the better. If one of you pulls the dacron over the sponge (as taut as possible) and the other staples the dacron to the lid of the basket. 4. Once you have stapled the dacron all the way round the lid cut away as much excess as possible. 5. Now you are ready to cover the seat in fabric. 6. 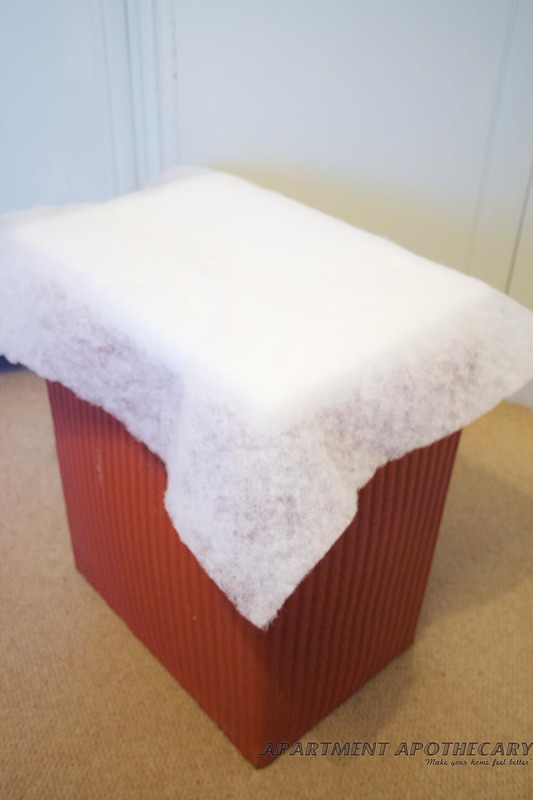 Measure the fabric so that there is enough excess to be pulled and stapled onto the underside of the lid. 7. 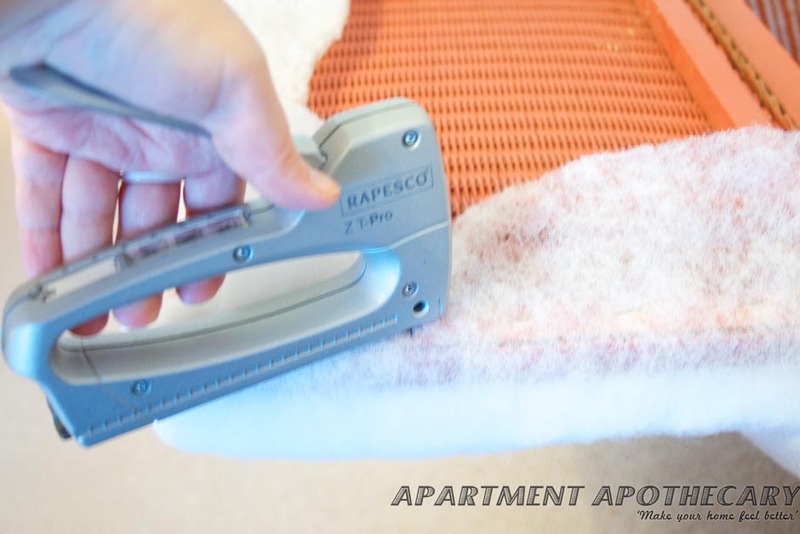 Just as you stapled the dacron complete that step with the fabric (and with help if you have it). Start at the sides and then do the front of the lid. At the corners make neat folds in the fabric, like hospital corners on a bed. 8. Leave the material at the back of the basket hanging down. 9. With the lid closed draw a V-shape on the fabric below each hinge: the top of the V should be as wide as the hinge and the point of it should meet the edge of the fabric. 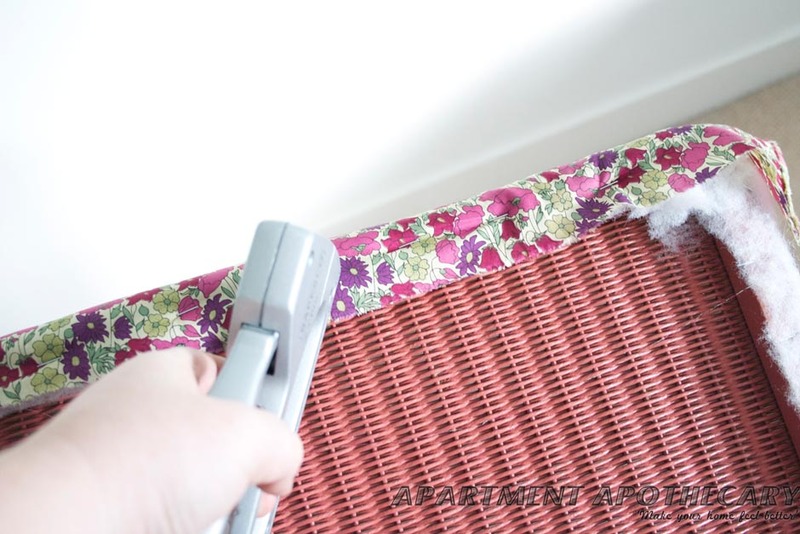 Pull the remainder of the fabric through and staple as before leaving the Vs hanging down the back of the basket. 10. Cut along each V and pull the resulting triangles around either side of the hinge. 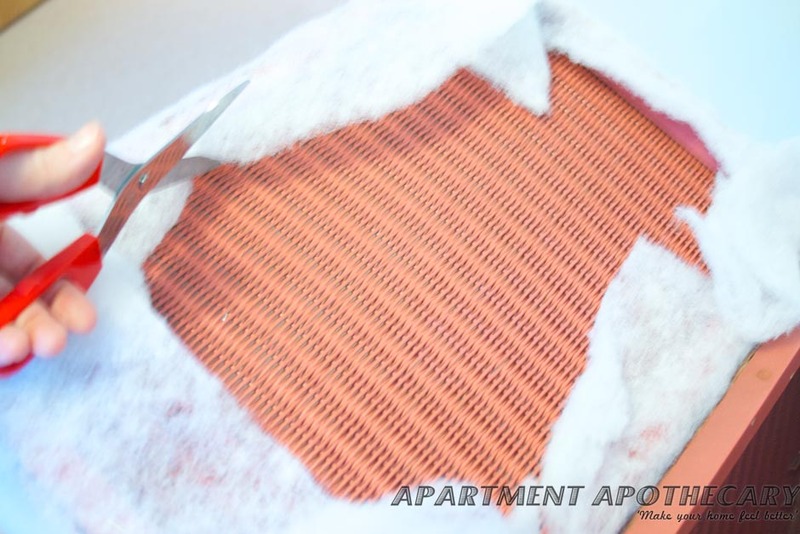 They can then be stapled along with the rest of the fabric. Ta da! 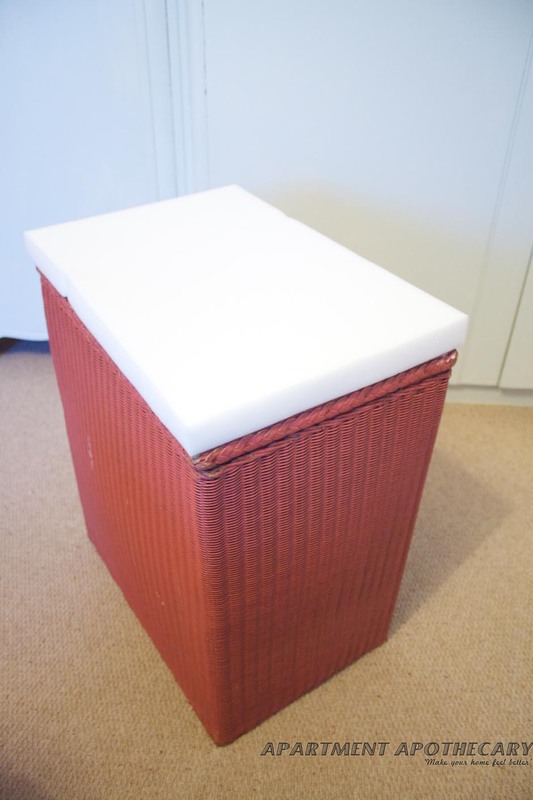 This can be used as an occasional table, laundry basket, storage or seat. Next time I am definitely going to do a toy chest, which will double as a low seat for children. Well done. You make it look so simple. that seems simple enough and the result is so beautiful. I want to do this. Such a lovely storage idea. My Weekend project! I have an old ottoman that am going to turn into a storage/ window seat for the kids to sit on. Figures crossed it will not be a disaster! I want to see the end result! 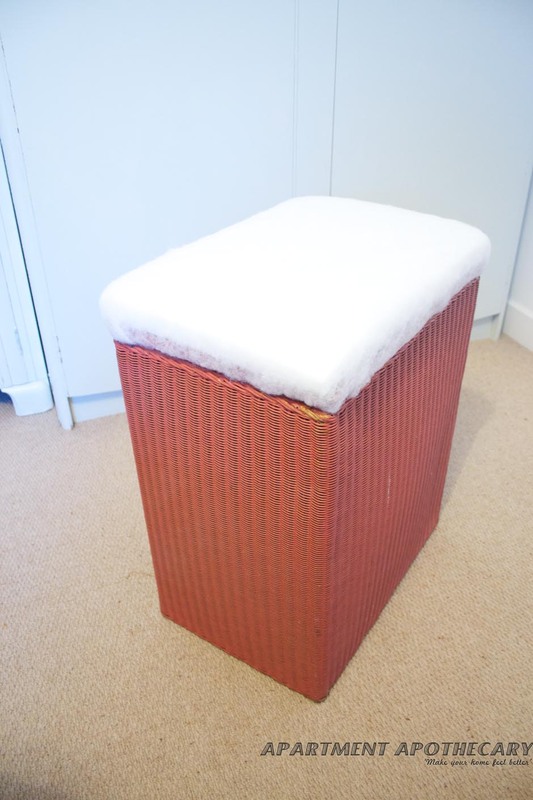 I have 2 Lloyd loom linen baskets for up cycling – Can I ask what do you suggest for painting/spraying as they need some tlc first?